It’s well documented that student loans are a big source of stress among graduates. For those carrying the 1.34 trillion dollars in student loan debt currently totaled in the U.S., the burden causes strain in ways you might be able to predict—loss of sleep, anxiety—and in some ways that are surprising. According to a recent SoFi member survey of over 1,200 respondents with student loan debt, the lion’s share of respondents confirmed how student loan stress impacts mental health. Eighty three percent shared that they’ve felt like they couldn’t relax due to the burden of the debt, and a full fifty percent felt that dealing with student loan debt has caused them to feel depressed. Over a third of respondents have reported actually losing sleep due to student loan debt, and a large number noted that it’s caused them to miss out on opportunities to travel, promote self care, and make major life decisions. Beyond that, fifteen percent admitted they’ve sought out a mental health professional to deal with the stress of their student debt. As student loan balances have jumped nearly 150 percent in a decade, so, too, has the extreme anxiety associated with it, to the point where professionals need to step in for some. And it’s not just about the extreme stress—there’s also extreme measures respondents said they’d go to if they could get rid of their student loans. 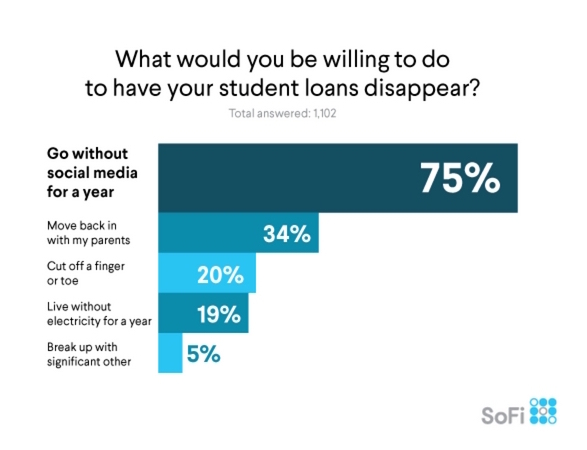 Seventy five percent of respondents shared that they would give up social media if it meant their student loans would disappear. Forty percent of respondents said they stay at a job that they hate because of student loan debt. And, yes—another twenty percent would willing to take even more dramatic measures by sacrificing a finger or toe. Through student loan refinancing—or consolidating student loans with a private lender for a potentially lower interest rate—those stressed out and burdened by student debt can put themselves on the path to lowering their monthly payments or getting rid of their debt faster. One member who has refinanced his student loans with SoFi, Ravi Kantha, explained how student loan refinancing has helped him “relax at night. Loans were a burden that cast a shadow on every decision. Every single financial choice we had to make was influenced by our loans—things as small as where to eat dinner and as large as where to live and how to invest our earnings.” This is an example of how refinancing is just one great avenue to decreasing student loan stress, and relaxing better by taking control of debt. That’s why SoFi is launching the “Refi and Relax” campaign, where those who refinance are encouraged to treat themselves and take license to kick back knowing that student loan stress is now somewhat alleviated. It’ll start with a launch party in New York on November 7th hosted exclusively for those who recently refinanced their student loans—featuring de-stressing activities like manicures from GlamSquad and playtime with Socials Tees puppies. Then, it’ll continue into the fall with a robust social media campaign. Check it out on social through the hashtag #RefiandRelax, and share your favorite way to relax after conquering student loans through student loan refinancing.